CNN/TwitterPaul McCartney at the ‘March for Our Lives’ rally in New York City on Saturday. Musician Paul McCartney attended the “March for Our Lives” rally in New York City on Saturday . He was referring to his Beatles bandmate John Lennon, who was shot and killed near Central Park in 1980. Legendary musician Paul McCartney took part in the “March for Our Lives” rally in New York City on Saturday, and was spotted not too far from where his former Beatles bandmate, John Lennon, was the killed due to gun violence in 1980. 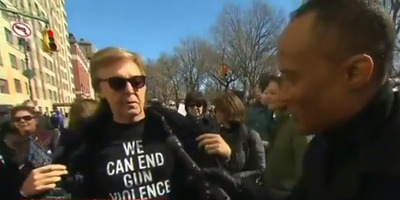 As McCartney sported a shirt that read “We can end gun violence,” CNN correspondent Jason Carroll asked him if he believed change could occur through legislation. On December 8, 1980, Lennon and his wife Yoko Ono, were walking to their apartment near Central Park after exiting a limo when Lennon was shot multiple times in the back at close range by lone gunman Mark David Chapman. Lennon was rushed to the nearby Roosevelt Hospital and was pronounced dead on arrival. Chapman was sentenced to 20 years to life in prison.